We are 12 days into parenthood and there is one thing that I'm beginning to realize about life that somehow in my 27.5 years of existence I never really realized before... It happens FAST - like really fast. How is it possible that we've had our little girl for almost 2 weeks already? I keep remembering those last several weeks of pregnancy which felt like they would never end and she would never arrive. I felt like the time passed so incredibly slow, especially when the night came and I'd wake up 5-6 times to go to the bathroom and lay back down just to stare at the clock until I dozed off again. "As it turns out, running is a lot like parenting: The days are long, but the years are short." I remember those months marathon training where I cursed the alarm clock for going off at 3:30am so I could get in that long run before 8am. Or the evenings at the parkway doing speed work where I just had to push through one interval at a time because thinking about doing 5 total wore me out. But in the end, meeting my running goals during those races felt like heaven at the finish line. And in the blink of an eye, my training months came to an end and I was staring at the start line of another race I'd prepared for. Here we are, 4 years of running later - 2 marathons, 9 half marathons, I lost count of how many 15ks, 10ks and 5ks - and it all just flew by. 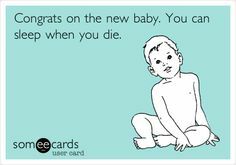 Well, parenting is a lot like that right now - specifically nursing at all hours of the night. When I'm falling asleep in the rocking chair hoping that Joanna finishes up so I can put her back to bed, I remind myself that I just need to make it to 5am (you called it, the initial first-time-mommy-adrenaline is starting to ware off). Because after 5am comes dawn and the long evening will be over. For me, it's the dim lit evenings in that rocking chair that feel the longest. But I also love my daughter with every fiber of my being, every ounce of my soul. And I know that I'm going to miss those dim lit nights in the rocking chair when I'm away traveling for work. I know I'm going to miss her unfinished diaper explosions which leave poop and/or pee on her changing pad cover because my new-parent-experience didn't know to have the new diaper ready before taking the old diaper off (okay this really happened multiple times so far, haha). And I'm going to miss just watching her sleep. And the scariest part is that in the next 10 weeks she is going to grow even more and there will be other memories we will make, that haven't happened yet... that I know I'm going to miss. So to sum it all up again, the days are long but the years are short. I realize now that time flys by and when the night comes again where I feel like I may not make it to 5am... I just have to cherish the snuggles and her little hands that curl around my finger, because these days will be over before I know it.